» Could the Jazz Be This Year’s Suns? Could the Jazz Be This Year’s Suns? As the NBA season draws near, Grantland’s NBA staff will be asking and attempting to answer a series of 20 pressing questions facing players, teams, and coaches. The top and bottom of the NBA are relatively predictable. We have a pretty good sense of who will be good (Spurs) and who will be bad (HINNNNKIE). The fun happens in the middle. A year ago, the Phoenix Suns broke up the regular-season monotony and entertained the hell out of us. Heading into this season, we can only hope another team can bolt from the middle class and capture our attention. If you’re looking for candidates, turn you eyes toward Salt Lake City. Most Vegas books have the Utah Jazz pegged to finish with right about 25 wins — the same number they won last year. That seems about right when you consider that the most notable things the Jazz did this offseason were pay Gordon Hayward the max after one of the worst years of his career, sign veteran cast-off Trevor Booker, and draft a 19-year-old Australian guard in the lottery. The reason for hope in Utah isn’t what it’s putting on the floor, but the guy running things from the bench. Last season, Phoenix made Jeff Hornacek its head coach, and the rookie shotcaller went 48-34. This season, Utah hired Quin Snyder. As with most coaching hires, it’s hard to really tell what Snyder is capable of in the NBA until he actually does it. All we know for sure is that he’s worked for an impressive list of coaches and he’s not Tyrone Corbin. And it’s the latter that is perhaps the biggest reason for optimism. To say the least, Snyder’s predecessor did not maximize the potential of his talent during his three and a half years in Utah. The most damning evidence of that is how some of his former players have blossomed under new coaches. Mike Budenholzer turned Paul Millsap into an All-Star (albeit in the East) after utilizing him far more on the perimeter. Al Jefferson, long a whipping boy for the Jazz’s defensive issues, anchored a Charlotte defense that ranked sixth in efficiency (again, playing in the East). Even after Utah appeared to upgrade defensively, from Jefferson to the athletic and mobile Derrick Favors, its defense plummeted to last in the league. The main issues on defense under Corbin were his pick-and-roll schemes. Even with Jefferson, Corbin often asked his bigs to hedge out to try to harass the ball handler at the point of the screen. Last year, Favors, the team’s lone rim protector, could be seen trying to contain Tony Parker for multiple dribbles 30 feet from the basket instead of dropping back to protect the paint. It was head-scratching decisions like that, and a general inconsistency in the schemes, that turned the Jazz into a total mess on defense. Snyder looks to have made things a bit more secure. The Jazz finished third in defensive efficiency this preseason. Granted, it is only preseason, but it’s still a promising development. It’s a stretch to think Snyder can turn a 30th-ranked defense into an elite unit with Favors as the only strong defender (though Steve Clifford did take Charlotte from last to sixth without much help), but the Jazz should be much improved. And that’s not even why you should start getting excited! Even after Jefferson and Millsap left, Corbin tried to play through Enes Kanter and Favors in the post during the early part of last season. Eventually Corbin wised up, using Marvin Williams as a stretch 4 and starting to run spread pick-and-rolls with Hayward and rookie Trey Burke. The change was smart, but the execution was lacking. One of the reasons Hayward and Burke struggled last season was because Corbin put them in static offensive situations without a clear directive. Great coaches help give their players a better understanding of the concept behind each individual action. Last year, you could tell that Hayward and Burke were operating with just a cursory understanding of how their pick-and-roll decisions affected the offense. The difference couldn’t be more noticeable while watching Snyder’s offense this preseason. Not only do the Jazz play faster, and with more fluidity, but there’s also a sophistication in the basketball thinking — something beyond “run this and try to score.” Pick-and-rolls are now a vehicle to facilitate ball movement. They are leading to drive-and-kick madness, a post-up seal on the weak side, or even a second pick-and-roll against a scrambling defense. You can see the influence from Snyder’s time coaching in Europe and for San Antonio’s D-League team. Imagine if the Jazz become the Junior Spurs!? Based on preseason performances, the young Jazz players are buying into Snyder’s San Antonio–flavored teachings. Hayward is taking better shots and growing into his role as a facilitator. Burke, in turn, is moving into positions — like spotting up or attacking scrambling defenses both off the bounce and out of second-side pick-and-rolls — that better suit his skill set. Favors is even flashing a decent jump hook! And we haven’t even gotten to the possibility of free throw magnet Alec Burks breaking out in this system. All in all, this Jazz starting lineup could be one of the league’s best, especially if Kanter grows into his new role as a stretch 4. 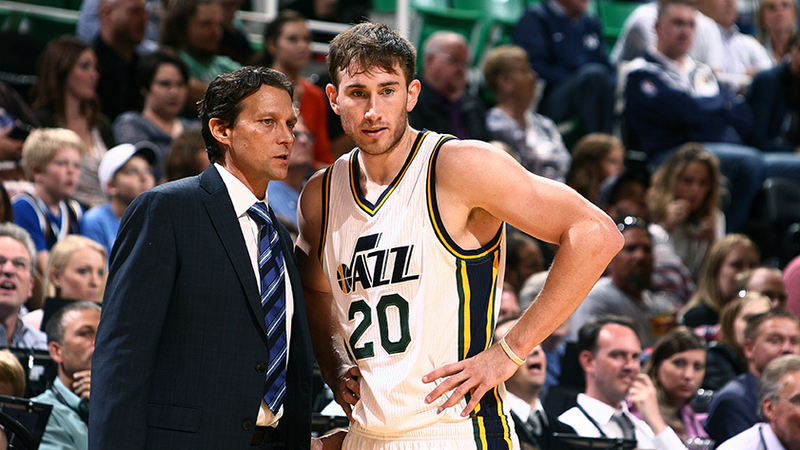 Improvement from those players will only mean so much if the Jazz bench can’t come through. Part of the Suns’ shocking run was down to their depth. Gerald Green and the Morris twins provided a scoring punch that went unmatched by most other second units. With two rookies and a raw big man, it’s any guess how the Jazz bench will fare. Utah’s young reserves will need to mature quickly if the team is going to exceed expectations. But boy, do they have upside. Headlining the reserves is rookie Dante Exum, who has already surprised people with his overall play in the preseason, especially his competency from beyond the arc (7-of-21). But it’s Exum’s fellow greenhorn, Rodney Hood, who might be poised to have the better season. Hood may lack Exum’s upside, but his polished game and smooth jump shot mean he can contribute right away. Then there’s the tangle of appendages that is Rudy Gobert. He had a mini-coming-out party for France during the FIBA World Cup this summer, and he rebounds like a beast. But he’s far from a finished product. 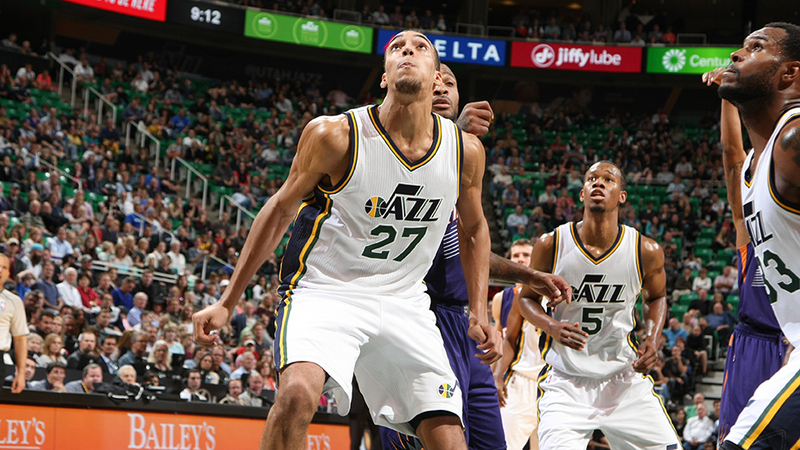 Gobert is going to make plenty of mistakes on defense as he continues to learn the nuances of the NBA game. But, at least once a game, he’ll make up for it by accidentally doing something awesome thanks to his insane length. Joining Gobert, in what should be a nine-man rotation, is Booker, whose trademark energy also comes with a surprisingly good handle that he never got to showcase with the Wizards. Kanter and Booker have been given the green light to launch 3s, a byproduct of Snyder’s emphasis on the shot (which, contrary to what Byron Scott tells you, is a good thing!). Judging by their preseason numbers — the two big men are a combined 6-of-25 from beyond the arc — that feels reckless, but if Booker (or Kanter) can improve throughout the season, it will provide a major boost to the team’s offense. One of the best stories from last season was the Suns’ startling success. As the season wore on, it seemed as if everyone who loves the NBA came to an unspoken agreement that Phoenix’s surprising contention and run-and-gun style granted them “second favorite team” status. For any League Pass junkie, their games became appointment television. To match Phoenix’s captivating performance — 48 wins after some Vegas books put their over/under at 19.5 — this Utah team would need to be both better than advertised and lucky. This year’s Western Conference is such a gantlet (with lottery teams like the Pelicans, Kings, and Nuggets getting better) that it’ll be even tougher for Utah to spring from nowhere into the playoff race. Even 40 wins and a brief dalliance with the 8-seed would be a remarkable achievement. The hope, however, is that the basketball gods smile on them and the Jazz prove capable of even more, while bringing fans like us along for the ride.